We are located at 1655 S. Main Street in Yreka, California. Our office hours are Monday-Friday from 8am-12pm and 1pm-5pm. Whether youth participate in clubs, after school programs, day camps, or other program settings, the 4-H Youth Development Program's mission and goals remain the same... to help youth develop their full potential! 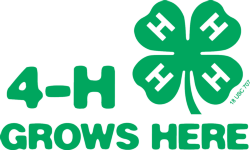 4-H Youth Development is a non-formal educational youth program, conducted by the University of California Cooperative Extension. The purpose of 4-H Youth Development is to help diverse young people discover and develop their potential and grow into competent, contributing, and caring citizens. Learn by doing activities, youth-adult partnerships, and research-based educational programs help young people enhance their leadership abilities and develop a wide range of other life skills. HOW: experiential education ("learn by doing"); bridging research and practice; building partnerships for programming and funding; cross-age learning and teaching; youth-adult partnerships. WHERE: school enrichment programs; community clubs; special interest projects and programs; school-aged child care; camp experiences; independent study; distance learning. BIG SPRINGS CLUB, meets at Big Springs School, located in Big Springs, on the 3RD MONDAY OF EVERY MONTH AT 7:00PM, leader is Darbi Whipple 530-598-4483. BUTTE VALLEY CLUB, meets at Macdoel Fire Hall, located in Macdoel, on the 1ST MONDAY OF EVERY MONTH AT 7PM, leader is Ellen Cundall 530-397-4400. DORRIS CLUB, meets in Dorris, on the 1ST MONDAY OF EVERY MONTH AT 7PM, leader is Olivia Palacios 541-591-0214. FORT JONES CLUB, meets at Scott Valley Junior High School, located in Fort Jones, on the 2ND MONDAY OF EVERY MONTH AT 7PM, leader is Caroline Luiz 530-468-2854. GAZELLE CLUB, meets at Gazelle Grange, located in Gazelle, on the 2ND MONDAY OF EVERY MONTH AT 7PM, leader is Vickie Beltramo 530-340-0174. GRENADA CLUB, meets at Grenada Fire Hall, located in Grenada, on the 1ST WEDNESDAY OF EVERY MONTH AT 7PM, leader is Caralee Scala 530-459-5788. RIVER VALLEY CLUB, meets at the Happy Camp Elementary, located in Happy Camp, on the 3rd TUESDAY OF EVERY MONTH AT 4:30PM, leader is Lynn Crocker 530-598-5335. TIMBERLINE CLUB, leader is Myndy Holbrook 541-281-4031.